OTTAWA – Grace St-Germain knows exactly what the participants of the World Junior Girls Championship are about to go through. St-Germain, part of Golf Canada’s national team program since 2014 and now starting her first season at the University of Arkansas (after a two-year stint at Daytona State College, where she was part of the NJCAA Women’s National Golf Championship-winning squad in May) made her debut at the World Junior Girls Championship in 2014 at Angus Glen Golf Club. She paired with Brooke Henderson and Naomi Ko and the squad finished third. It was her first time representing Canada on a golf stage, and says it was a moment she would never forget. “It was so fun to meet all the girls from around the world, and being able to finish third alongside Brooke and Naomi is something I’ll keep in my heart forever,” says St-Germain, who is playing at Arkansas with a fellow World Junior Girls Championship competitor from Mexico. St-Germain says being able to play in the World Junior Girls Championship solidified her desire to represent Canada while playing golf. As a Canadian, she’ll always fly the Canadian flag on the course. But to legitimately wear her country’s colours was a unique and exciting opportunity that she is eager to repeat. 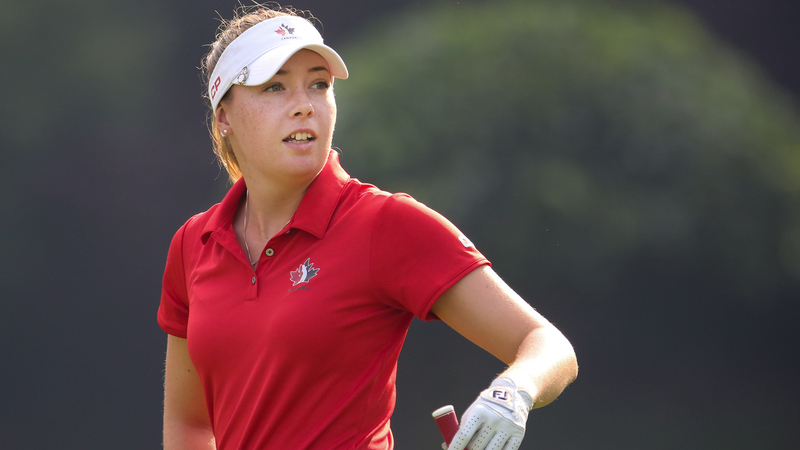 The 20-year-old has been with Golf Canada’s national team program for four years. She had to unfortunately miss the CP Women’s Open in Regina, Sask. due to commitments at Arkansas, but did enjoy a successful summer season – capped off with a win at the Quebec Women’s Amateur in June. St-Germain is also a member at Camelot Golf and Country Club, the host layout for this year’s World Junior Girls Championship. She says the key to success for the participants this year will be to have a solid game plan and try to stick with it. She says there are a “bunch” of holes at Camelot that can cause headaches, and she says driving it straight will be key. As St-Germain begins the next stage of her career in Arkansas (with 6:15 a.m. workouts, she says with a laugh and a typical college-student groan) she’s reflective in thinking back to what her time at the World Junior Girls Championship meant to her and her career. She’s hopeful the girls who participate have as much fun as they can and just enjoy the moment.